I received my table - they upgraded us to the $420 Xu Shao Fa table. It's very solid, paintwork on the top is good, however the white lines have a few minor imperfections. The rubber bits on the feet are pretty bad, one of them is very misshapen and doesn't fit as well as the others. The folding lock on one of the sides is also a bit glitchy, takes a few attempts to get it to lock and unlock. I don't like the little wheel things that are used to increase / decrease height of the wheels / legs. They are difficult to use and I feel like they could break easily. I remember my old club had Stiga rollers that had a system that was much easier. It's great for the price, the quality is more invested the top mdf and the solid frame than the legs / wheels other bits. Thanks WorkoutMontage, that's really good feedback for anyone else considering this table! I'm looking at getting a table for under pergola. Is fairly protected but when the weather is a bit wild, the rain can blow in a little. I'm intending on packing up the table after playing but I'm worried if i get a bit lazy or leave it up for another session the next day then the rain comes in, will a few spots wreck an indoor mdf table. Perhaps i should fork out a bit extra for an outdoor table. Has anyone had experience with the in regard to the bounce and speed? In my experience outdoor tables play all kindsa weird. The sound may be a big part of that impression (like how a blade sounds different and makes you think it "feels" different) but at least the OD tables I've played on have been pretty slick/shiny, so ball slides more. Does it bounce higher or lower, I'm not sure. It's certainly something you can adjust to, and if it means you'll be playing more it's going to help you more than hurt Ya! As for an indoor that might occasionally get wet: at the summer camp I've gone to/worked at for 17 years, we used to have an indoor table that lived in the craft hall, which had large openings on two sides, so rain could occasionally blow in, mist/fog could drift through, etc. That thing was warped and wonky with lots of bubbles on the surface. Now we've got an outdoor one (Kettler I think) that lives in a pavilion, it's doing fine and dandy. So from my experience Id recommend the outdoor table for your situation. Thankyou for that, I'm guessing that dew could be a killer even if it didn't rain. I helped out with a high school science project last year that involved testing the effect of table tennis table thickness on ball bounce height. It very much confirms what most players know that tables thinner than about 16mm are not suitable for competitive play. Hope some of you find it useful, pdf attached below. Well done tt game, enjoyed the read. I wonder if the results would be different with different wood or even paint. to the thinner board deflecting during the ball impact"
Solid steel powder coated black frame. Wheels are solid. Only slight issue is that one of the catches is a bit sticky, no worries though. It MAY be slightly slower and lower bounce but to be honest I can't tell. The reason competition table are 25mm not 18mm is for the bounce and speed otherwise they would just use 18mm so I can only assume that its a bit slower, as I said, can't tell though. Too soon for me to tell. It will be packed up after play and stored undercover with a cover over it. Outdoor temperature will range from about 0c to 43c over the course of a year. Come in a single box weighing 85kg. Was easy to put together as only had to put the legs and wheels on. The cost of this table was around AUD$365, on sale from an advertised $700 plus shipping is extra so at that price I think is a really great buy. At that price point I think there is a bit of rubbish around that have a similar advertised build but at the end of the day they just don't perform. If you can get this table for that price, you want be disappointed. Would I pay $700 for it? Not sure, certainly wouldn't dismiss it but would want to see what else is around at the time. Does not come with a net. Thinking of getting the Joola Tour 1800 - 18mm surface. Around $550 (US). Too soon for me to tell. It will be packed up after play and stored undercover with a cover over it. Outdoor temperature will range from about 0c to 43c over the course of a year. Cobalt, how has this held up for you in the undercover-but-outdoor environment? 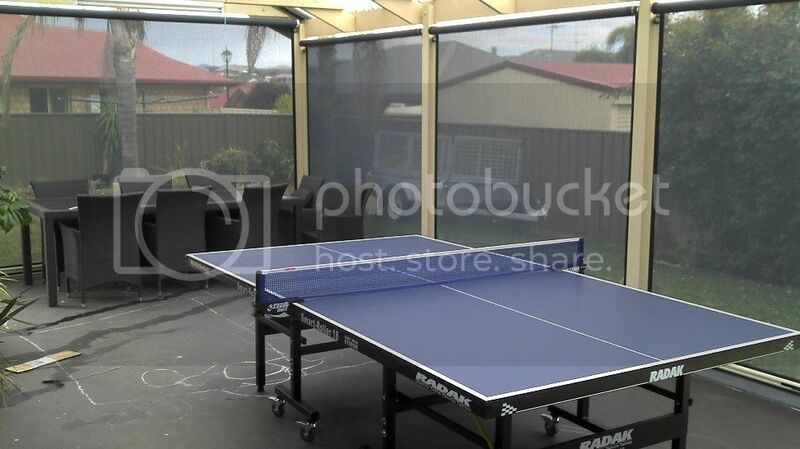 I bought an aluminium-topped outdoor table to use on my covered rear deck, but I don't put it away or use a table cover, so it is exposed to condensation, some weather, and Melbourne temperature ranges probably similar to yours. I'd be interested to know if a wooden table, if properly covered after play, can handle outside temperatures without warping. The Joola Tour 1800 looks very similar to the Radar above. Can't imagine it's any worse, especially since it's a brand name table. For home use even for a competition player it should be fine. Can't comment on price as sure what the going rate is over there. Haven't had it out since June but probably will this weekend as the weather is starting to pick up. Was still in top nick after the summer though, can't imagine there will any issues. Had the table out on the weekend for the first time in 2-3 months. Its kept undercover with a cover on it but outside. Its winter here with temperatures overnight about 1 to 7 degrees overnight and 11 to 14 degrees during the day. I've now had the table for about 12 months where its seen both an Australian summer and winter and there are no signs of bowing, warping, rust or any other type of weather damage.